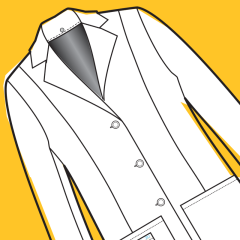 Do you wear layers either over or under your medical uniform? Are you tired of compromising your professional appearance in order to stay comfortable at work? The Twice as Nice patented design provides you with flexibility and comfort through a removable liner that regulates body temperature, is moisture wicking, antimicrobial, and can be easily detached in seconds. Twice as Nice Uniforms keep you warm when it’s cold and cool when it’s hot. The Twice as Nice liner separates our uniforms from the typical scrub. 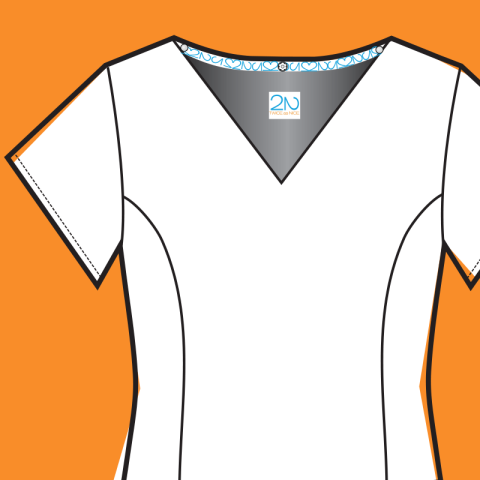 It eliminates the need for layers either over or under your scrubs, without adding bulk or weight or limiting movement. It breathes and wicks moisture, keeping you dry and fresh. Each uniform comes as a set – an outer uniform along with a hidden, removable liner. Attached to the outer scrub with nearly undetectable snaps, the liner can be quickly and easily removed. The inner layer is not noticeable through the outer garment. You can wear the scrub top or pant with or without the liner or any combination, giving you flexibility and options. The scrub top liner is a shell that keeps your core warm without adding bulk or weight or limiting movement. It eliminates the need for long sleeves (and the worry of liquid splatter on your sleeves). In heat, it breathes and wicks moisture, keeping you dry and fresh. 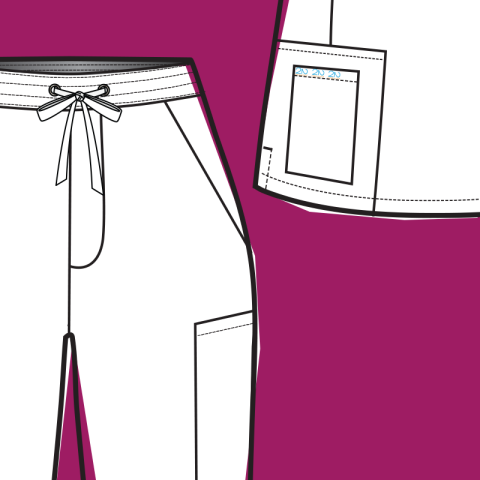 The scrub pant liner is carefully designed to not add bulk at the waistline. The liner sits comfortably below the waist and snaps just above your ankle so it stays in place. At Twice as Nice, we take fit VERY seriously. In order to care for others, we know that you need to be comfortable while also maintaining a professional appearance. To ensure that our designs work for the many body shapes of real women, we have a Fit Specialist on staff who works with some of the top labels out of NYC’s garment district. 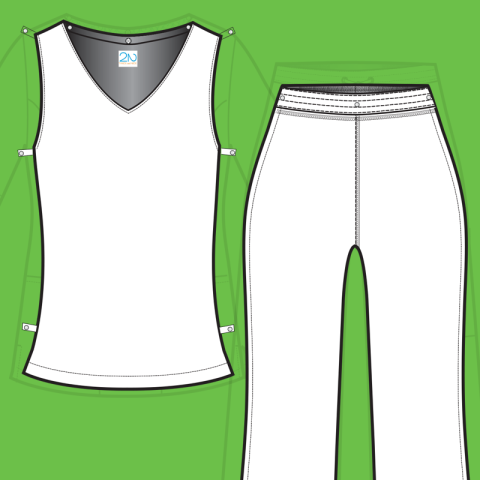 The result is a new type of scrub design that is more like tailored sportswear. Our revolutionary concealed cinch waist in the labcoat gives you unparalleled flexibility and easy adjustability with a hidden drawstring. The pant waistband is designed like a trouser with strategically placed darts for a flattering silhouette, yet still has the comfort of the traditional drawstring waist. Our scrub tops have princess seams to accentuate your figure without being too tight or uncomfortable. We offer two different styles with two completely different fits so you can choose the style that works best for you — the Debora model with a more tailored look with shorter sleeves and slimmer cut pants and the Darla style with a more relaxed fit with added ease in the waist, hip and thigh. Fabric is important to us. Our finishes go to work for you, demonstrating our investment toward function and fashion. Our scrubs and labcoats are highly resistant to staining from blood and chlorhexidine. Our fabrics are of higher quality than a typical scrub. The outer fabric has a two-way stretch that moves with you without losing its shape. It launders easily with no need for ironing. The liner fabric is a high tech, interquilt waffle-knit with two way stretch and needs no special care. The antimicrobial and moisture wicking properties of the liner keep you looking looking fresh and fitted all day. The waistband in our pant is a plush elastic, unlike any other scrub on the market. ‘Plush elastic’ is the type of stretchy fabric that is typically reserved for underwear and sports bras. It has tighter stretch and recovery but is still comfy. It fits close without pinching, bunching or gapping. The 2aN liners connect to the outer scrub using soft, smooth and durable plastic snaps (to avoid any potential metal allergy issues). The snaps are small and undetectable but durable and hold the liner in place. Our pockets are ample and functional – structured and large enough to hold tablets and any size cell phone. We insist on more stitches per inch (SPI) than typical uniforms. This means that your Twice as Nice scrub is made of softer, less-stiff fabric that will last longer and be more durable than your average uniform. We do it all right here in the USA! We are so proud to be part of the movement of bringing textile jobs back in the States. Not only does this help our local communities prosper, it allows the 2aN team to personally oversee the craftsmanship of our garments. We work side-by-side with our pattern-makers, our knitters, our cut-and-sew operations, and our finishers. This daily collaboration ensures high-quality, high-caliber workmanship and garments that work for you.